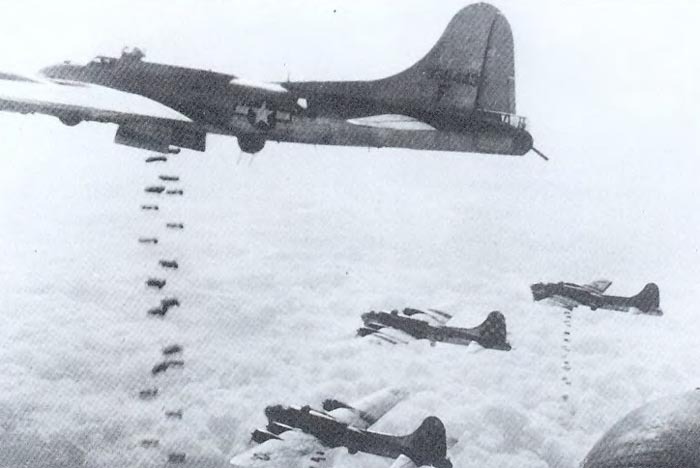 B-17G Fyling Fortress dropping bombs on a target in February 1945. Europe – OPERATION CLARION: 9,000 Allied bombers and fighters from bases in England, France, Belgium, Holland and Italy attack rail and road targets over 647,497 sq km of the Reich. 8th USAAF alone attacks 30 targets, including Lüneberg, Halberstadt, Ludwigslust and Göttingen. Germany: 373 RAF bombers attacking Worms. 349 RAF bombers attacking Duisburg. Germany: Fugitive Vichy leader Jacques Doriot, killed in air raid; aged 56. Turkey declares war on Germany and Japan. Uruguay declares war on Germany and Japan.